The Archaeological Society of Alberta (ASA) is an amateur organization of over 400 members who are dedicated to promoting, protecting, and preserving Alberta’s heritage. The society regularly holds events that allow the public to actively experience archaeology in the province. 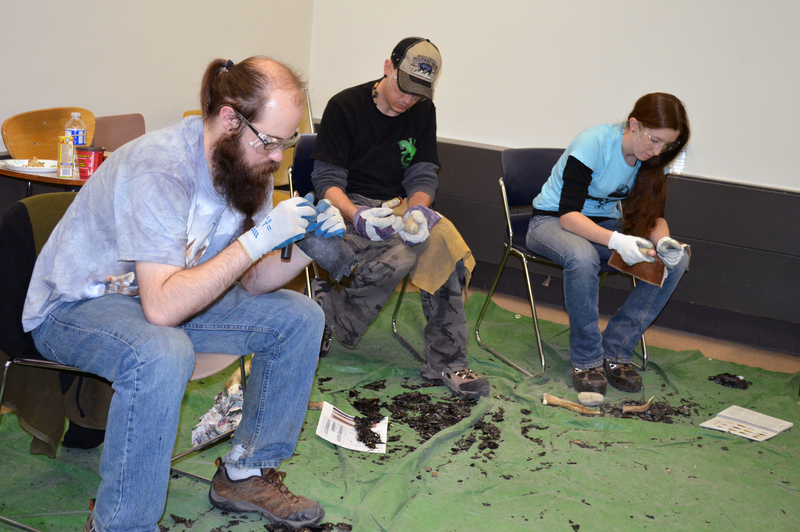 In March the Strathcona chapter of the ASA held a flint-knapping and tool-making workshop in Edmonton. The ASA workshop allowed members to get first-hand experience making the stone, or lithic, tools that are among the most common artifacts found in archaeological sites in Alberta. 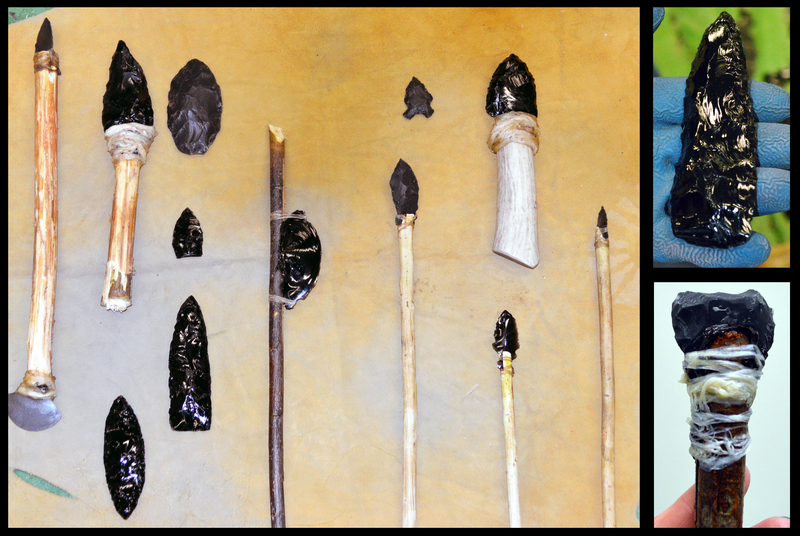 Prior to the arrival of metals with Europeans in North America, First Nations people created tools such as blades, knives, axes, and projectile points, by knapping stones. Knapping technology is not unique to Alberta, but was used by humans and our ancestors in all parts of the world beginning as early as 3.3 million years ago in Africa. Today many archaeologists practice knapping to better understand the material culture recovered from archaeological sites. Knapping is also a common hobby among archaeologists and non-archaeologists alike. First, cores of lithic raw material are precisely broken using hammerstones (stones and antler) to produce large, flat flakes. At the workshop, participants knapped obsidian and dacite, two types of stone that are easy to use for beginners. When knapping, safety is always top priority. Striking stones such as obsidian produces tiny shards of the material, which tend to scatter and can easily cause injury. To prevent accidents, knappers use hand and eye protection, and always have plenty of bandages at the ready. The scattered waste flakes produced when knapping are called ‘debitage’ by archaeologists. ASA participants using hammerstones to produce lithic (stone) flakes and debitage. Next, smaller flakes of stone can be worked into tools. Instead of striking the stone, smaller flakes can be removed by applying consistent force in a process called pressure flaking. 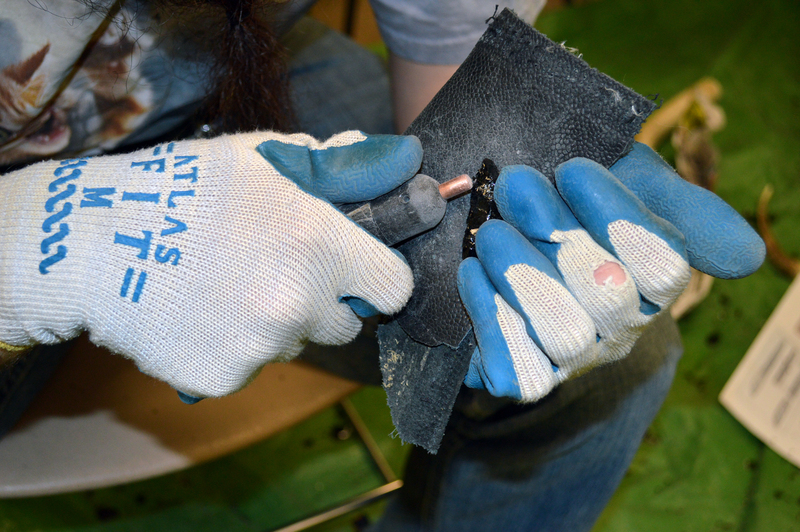 In the picture below, a knapper is using a copper pressure flaker to work the edge of a projectile point. A knapper using a copper pressure flaker to work the edge of a projectile point. Finally, the knappers were able to haft their new tools onto wood or antler shafts and handles. The stone tools were affixed into the wooden handles using pine pitch, and then fastened using animal sinew and hide glue. In archaeological sites the organic shafts, handles, and fastening materials have usually decayed, leaving only the stone tools behind. Becoming a good knapper takes a lot of patience and practice, and it helps to have a good teacher. 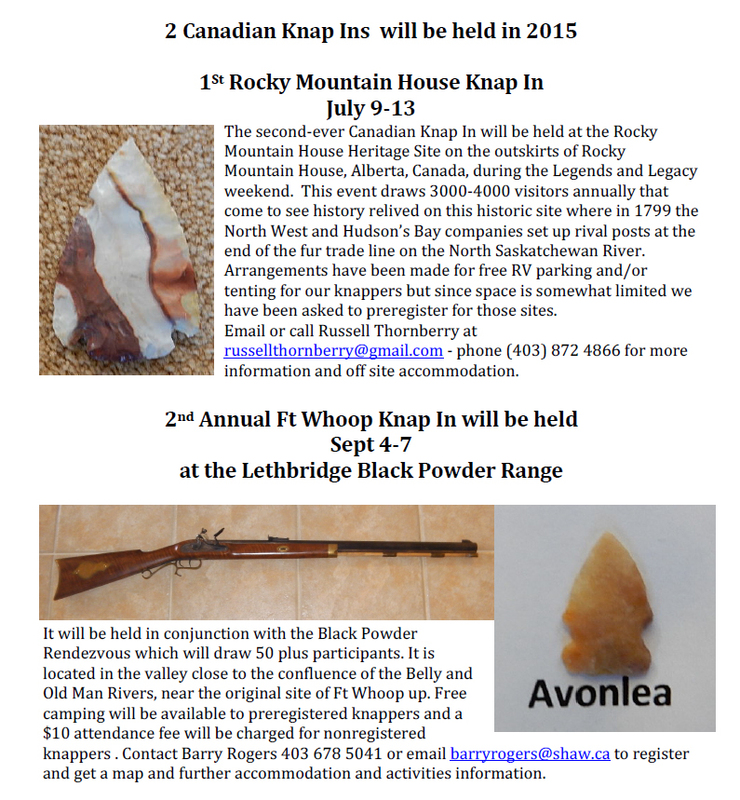 If you are interested in learning how to knap stone tools, there will be two knapping events in Alberta this year in July and September. Written by: Colleen Haukaas, Archaeological Permits & Digital Information Coordinator. Sunday, June 21 marks National Aboriginal Day—an opportunity to take time to learn, acknowledge and celebrate the rich contributions Canada’s First Nations, Metis and Inuit have made to our country. Officially proclaimed in 1996, National Aboriginal Day is now recognized nation-wide as part of a series of Celebrate Canada days. If you live in Edmonton, APTN’s Aboriginal Day Live & Celebration will be hosted in Louise McKinney Park on Saturday, June 20 and additional community events will be held throughout the week. 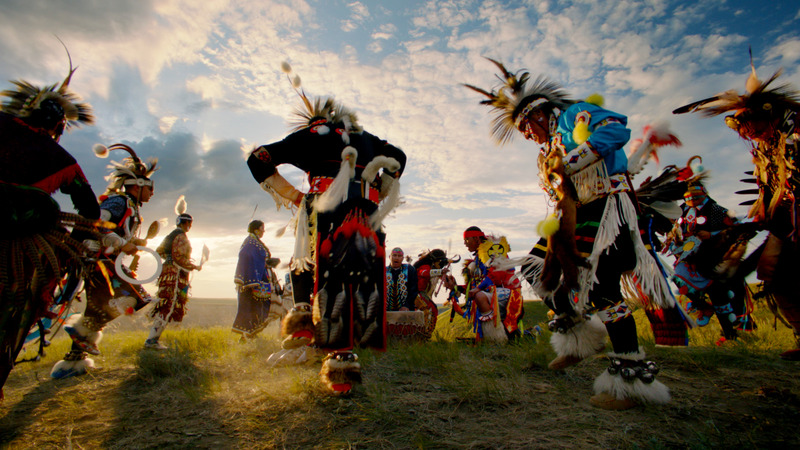 Aboriginal Awareness Week Calgary’s theme this year is ‘Keeping the Circle Strong,’ with events taking place June 14 – 21. Additional events in Alberta are listed here. Is your community hosting a National Aboriginal Day event? Share it with us in the comments below! A massive brick chimney at Medalta Potteries towers six metres above the roof of “Building 10” and extends roughly the same distance from the roof to the dusty factory floor below. Two meters wide at its base, the chimney and accompanying boiler were vital in the production of clay products from the early decades of the twentieth century until the plant’s closure in the 1960s. Now a Provincial Historic Resource, Medalta Potteries in Medicine Hat has evolved into a vibrant community hub that includes the Medalta archives and interpretive centre, galleries and displays, a working pottery that reproduces classic Medalta ware, a contemporary ceramics centre for professional artists, and a venue for markets, weddings, concerts and other community events. The tall brick chimney and distinctive monitor roofs of the former factory buildings provide the iconic backdrop for these varied activities. 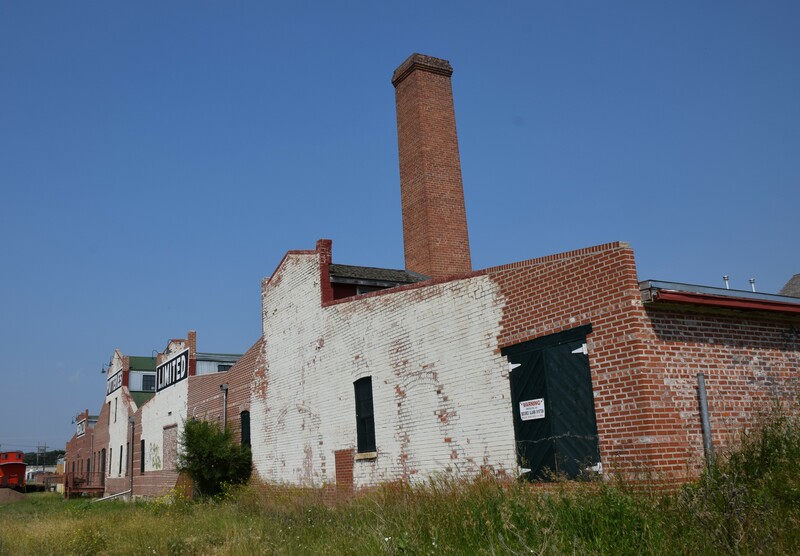 Medalta Potteries in 2014, looking west to Building 10 before rebuilding of the chimney. Already leaning slightly to the south, the chimney developed a worrisome new tilt after the June 2013 southern Alberta floods, an event which inundated much of Medalta and the nearby residential neighborhoods. As soil conditions on site gradually normalized in early 2014, the chimney’s foundation shifted and subsided further into the clay-rich soil, raising concerns about its stability. The only practical long-term conservation option was to disassemble the chimney and rebuild it with the original, locally manufactured brick using traditional masonry materials and construction methods. Conserving the chimney started with extensive photographs and measurements followed by disassembly by a contractor specializing in historic masonry conservation. Medalta’s staff archaeologist monitored and documented the process. As the chimney came down brick by brick, unexpected finds within the masonry included an old whisky bottle; fire bricks from Hebron, North Dakota; and a bizarre series of wasps’ nests occurring at roughly one metre intervals within the stack. This corresponds roughly with the work a team of masons would likely have completed in a typical day – a coincidence that begs further explanation. The chimney-dwelling wasps turned out to be quite blind and fortunately did not harass the masonry crew as dismantling proceeded. The most intriguing relic, however, was a cluster of bricks inscribed with names and the inscription “IX 44”, presumed to represent a date. The names went unobserved until mortar dust from the disassembly process settled lightly onto the brick and highlighted the writing. Prisoners of war interned in Medicine Hat during the Second World War were recruited for work in local industries to offset the wartime labour shortage. Research now underway may reveal that some of these POWs, possibly even masons in their pre-war lives, helped repair the chimney at Building 10 in September of 1944. Chimney rebuilding is nearing completion and will replicate its historic appearance — without the lean to the south. Glazed bricks set into the chimney mark the locations of the autographed bricks and, soon, visitors to Medalta will be treated to a new exhibit in Building 10 featuring the original bricks and an account of this chapter in the site’s remarkable history. To recognize the centennial of the First World War, the Provincial Archives of Alberta launched the Alberta & the Great War exhibit in August of last year. Using letters, photographs and formal war documents, this exhibit captures the experiences that Albertans endured during the Great War. There are five topics within the exhibit: the Western Front, Women and the War, Opposition and Oppression, the Home Front and the Aftermath, to show that there were several struggles going on at once during and after wartime. 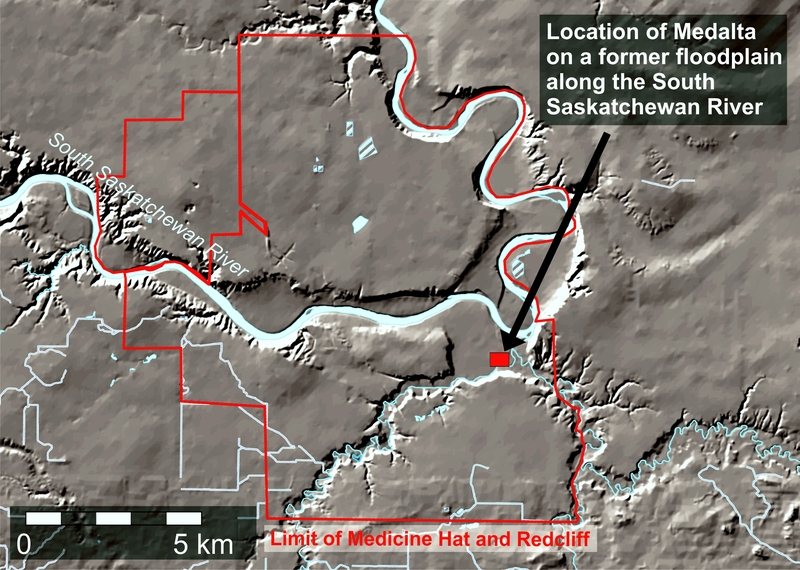 The effects of these events produced repercussions that remain evident in Alberta to this day. The exhibit was assembled largely from the material found at the Archives, with a few artifacts on loan from the Royal Alberta Museum. Braden Cannon, a Private Records Archivist with the Provincial Archives of Alberta, will give an introduction to the exhibit that he curated. The Great War had a tremendous effect on individuals and the province of Alberta as a whole. This display gives the public the opportunity to see into the lives of the Albertans who were at the forefront of the war and shows the impact of the conflict that reached the people back home. The archival materials used in the exhibit are a valuable record of this period in history. Exhibits, such as these, ensure that the individuals who served in the First World War and the substantial events of the past are not forgotten. 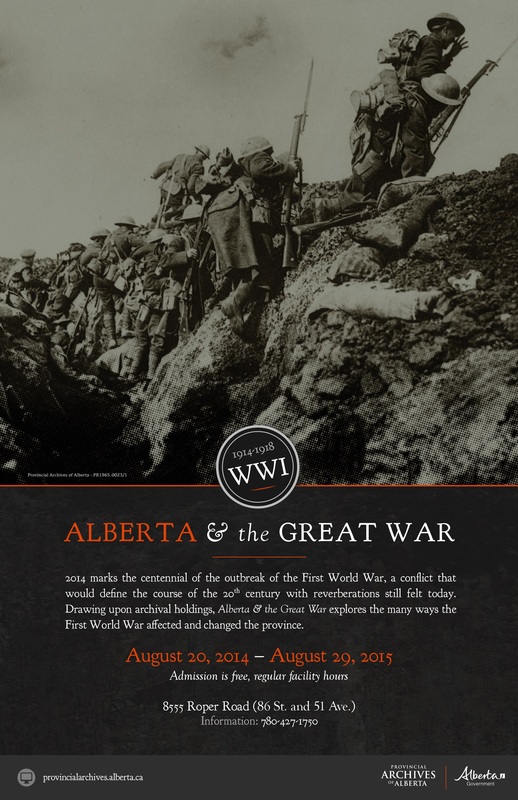 Alberta & the Great War will run until August 29, 2015. Video and summary by: Erin Hoar, Historic Resources Management Branch Officer. A special thank you to Braden Cannon at the Provincial Archives for appearing on video! Image courtesy of the Provincial Archives of Alberta.